LOCATION-LOCATION !! sitdown Breathtaking White Water, Coucher de soleil, et Catalina Vues, ​​à partir de cette chambre 3 + bureau magnifique maison sur une plage privée culdesac fermée. Un délice pour le Corporate Executive ou Villégiature famille. cuisine et design détails Gourmet partout. Profitez des dauphins et des phoques gambadant devant votre plate-forme, un spa, et belle maison personnalisée histoire unique avec de hauts plafonds et puits de lumière. Marcher sur la plage de San Clemente ou d'un sentier pour les miles en entrant par la porte privé à la plage. À moins de 30 minutes en voiture de l'aéroport de Orange County, Dana Point, Laguna Beach, Newport Beach, Divertissement et Parcs d'attractions. Seulement 45 minutes en voiture de San Diego County ou 1 heure à Los Angeles visites. Beach, waves, 180 degree ocean views, relaxation awaits! The home is beautiful and very inviting - surrounding areas are wonderful. If you love the ocean and beach the view is 2nd to none. Sunsets amazing. Restaurants are almost all good in the area. So easy to go to San Diego, LA, or the endless beaches to the North or South. If you need to relax and want to sit on a wonderful beach without the crowds come here! This is a beautiful home on a quiet street with crashing waves serving as continuous, lovely background noise. The property is exactly as depicted in the photos and description (better, actually) and the booking process was quick and efficient thanks to the owner's prompt response to my inquiry. Any information we needed about our stay was provided prior to our check-in date, and everything was just as expected when we arrived. The house is clean and airy with a large kitchen area that is stocked with any and all cooking tools one would need for any occasion. It’s also just a quick drive to restaurants in town or neighboring Dana Point. I should stress that the view and sound of the ocean from the entire back side of the house is just astounding, so staying/ordering in, at this house in particular, may be the better option. The beds are comfy and bathrooms are nice, especially the large master bath, with open living areas great for relaxing. I really couldn’t have been more pleased with our stay, and despite it being just my husband and me, I will check the availability of this property first when I book our next visit a few months from now. This home’s combination of amenities and proximity to the beach can’t be beat. From the long deck that fronts the house you have views up and down the coast for miles. And from inside the home, large windows that run along the length of the house offer fantastic white-water views of the waves rolling into shore. 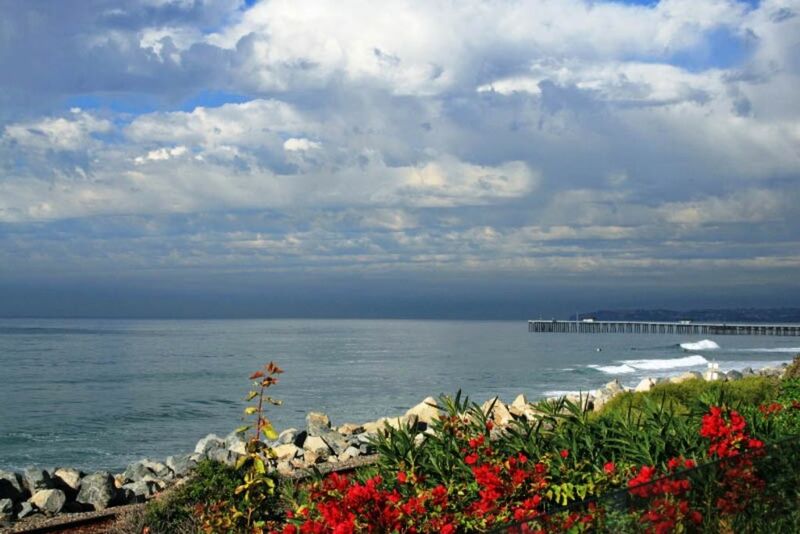 There are few homes in San Clemente as close to the beach as this one. There’s nothing between you and the sand except for some railroad tracks that carry the occasional commuter train, which actually adds to the charm of the setting. And it’s only a 15-minute walk along the sand to the pier area, which is home to a couple of good restaurants. The house itself is extremely well kept and the gourmet kitchen has every conceivable cooking item you could need. The house is also loaded with multiple TVs and a great sound system, and the owners provide all the umbrellas, chairs, towels and boogie boards a family needs to enjoy the beach. We found the owners pleasant to deal with and quick to respond to our needs. A minor problem that cropped up on our first night was dealt with immediately. We have stayed in many San Clemente homes during vacations there over the past 35 years and none of them come close to this one. This property was as beautiful as the pictures posted on VRBO. The ocean view from the deck was awesome, the sunsets amazing, and access to the beach was very convenient. The San Clemente Pier was in walking distance on a nice path. It was close to Disneyland which the grandkids so enjoyed and they also loved the trains that went by every day. The kitchen was well equipped with everything you might need. The owners were always available if we needed anything or had any questions. It was a wonderful week and we hated to leave. We would absolutely come back!!! from almost every room the most amazing view of the Pacific ocean I have ever seen. Rates are Subject to Change until Reservation is Confirmed. The maximum amount of occupants is for daytime and nighttime. No weddings or events are allowed.